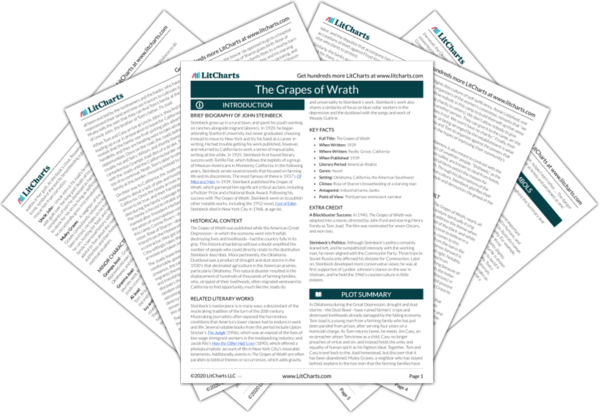 Instant downloads of all 942 LitChart PDFs (including The Grapes of Wrath). 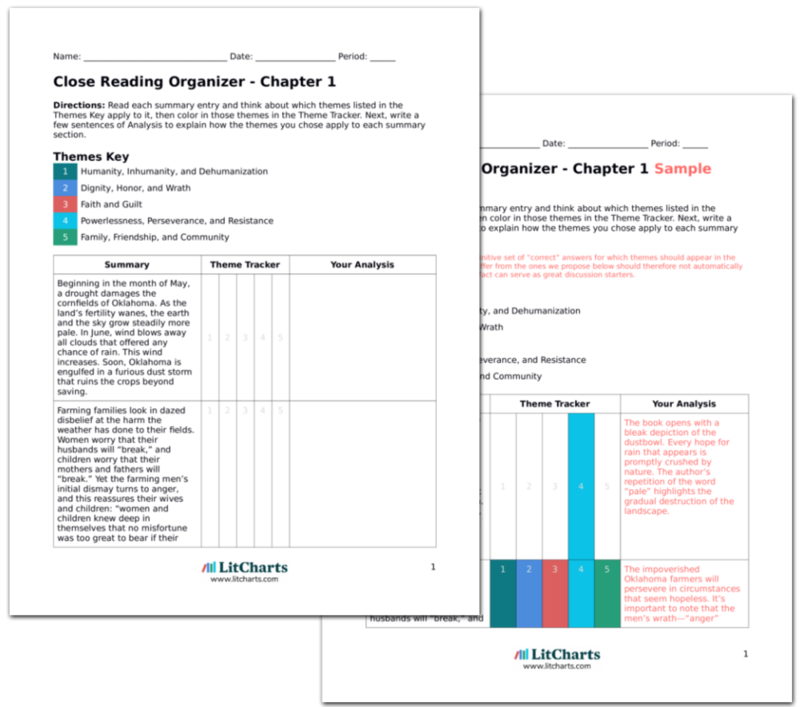 LitCharts assigns a color and icon to each theme in The Grapes of Wrath, which you can use to track the themes throughout the work. Despite their destitution, Okies are shown to be extremely conscious of maintaining their honor. No matter how dire their circumstances, the Joads are unwilling to stoop to accepting charity or stealing. When they do accept help, they are quick to repay the debt—for example, when the Wilsons offer Grampa Joad a deathbed, Al repairs their car and Ma replaces the blanket used to shroud Grampa. With this strong sense of honor comes an equally powerful notion of righteous fury: when Okies are wronged, their anger is what gives them the strength to press onward. Toward the end of the book, when California’s winter floods threaten the Okies’ livelihood, Steinbeck writes that “as long as fear could turn to wrath,” the Okie families would be able to continue their struggle. Dignity and wrath are a defining part of Okie culture. For instance, Steinbeck describes a migrant family that is unwilling to pay anything less than the sticker price for a meal at a restaurant, because to pay less would be no better than stealing. The organization of the government camp also highlights this culture of self-sufficiency. Annie Littlefield, one of the organizers of the women’s committee, remarks that “we don't allow nobody in this camp to build theirself up that-away [by giving charity to others]. We don't allow nobody to give nothing to another person. They can give it to the camp, an' the camp can pass it out. We won't have no charity!” Finally, their justified anger at being wronged by the establishment is what motivates Casy and Tom to organize against the powers that oppress them, in the hopes of improving their community’s welfare. The Okies’ honorableness is also meant to contrast with the unscrupulous conduct of wealthier people. “Shitheels,” as the affluent are sometimes called, are known to steal from hotels, just as banks and industrial farms extort the masses for everything they’re worth. Through his descriptions of the dignity and morality of Okie culture, Steinbeck glorifies their humble, self-sufficient lifestyle and denounces the greed of the upper classes. The ThemeTracker below shows where, and to what degree, the theme of Dignity, Honor, and Wrath appears in each chapter of The Grapes of Wrath. Click or tap on any chapter to read its Summary & Analysis. 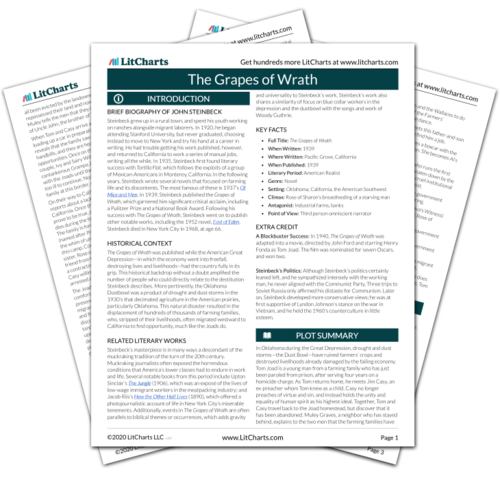 Get the entire The Grapes of Wrath LitChart as a printable PDF. 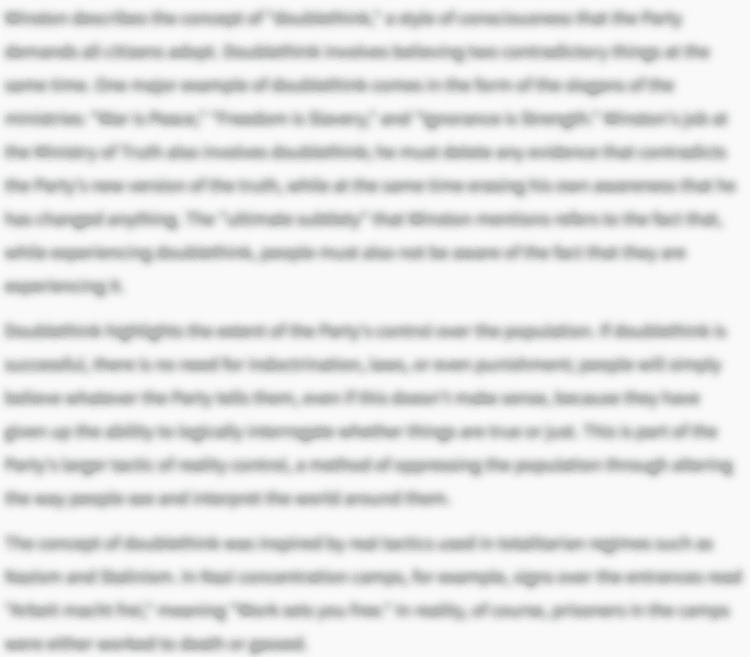 Below you will find the important quotes in The Grapes of Wrath related to the theme of Dignity, Honor, and Wrath. Women and children knew deep in themselves that no misfortune was too great to bear if their men were whole. 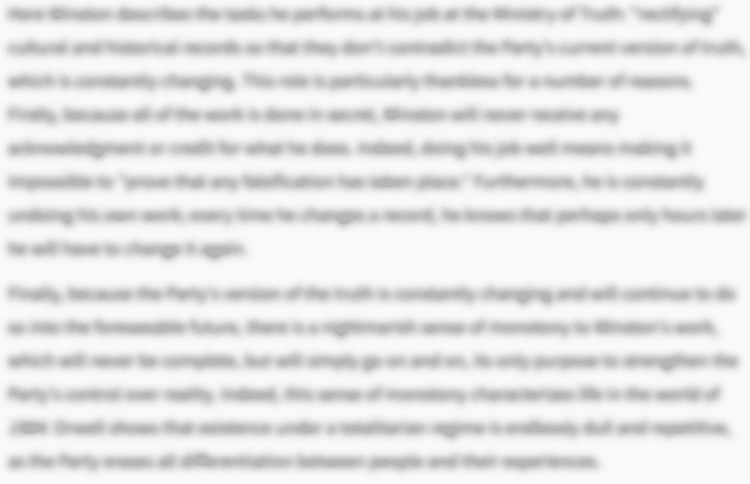 Unlock explanations and citation info for this and every other The Grapes of Wrath quote. To California or any place—every one a drum major leading a parade of hurts, marching with our bitterness. And some day—the armies of bitterness will all be going the same way. And they'll all walk together, and there'll be a dead terror from it. And now they [the Joads] were weary and frightened because they had gone against a system they did not understand and it had beaten them. Fear the time when Manself will not suffer and die for a concept, for this one quality is the foundation of Manself, and this one quality is man, distinctive in the universe. Here is the node, you who hate change and fear revolution. Keep these two squatting men apart; make them hate, fear, suspect each other…the danger is here, for two men are not as lonely and perplexed as one. The great companies did not know that the line between hunger and anger is a thin line. And the women sighed with relief, for they knew it was all right—the break had not come; and the break would never come as long as fear could turn to wrath. Tiny points of grass came through the earth, and in a few days the hills were pale green with the beginning year. Sobel, Ben. "The Grapes of Wrath Themes: Dignity, Honor, and Wrath." LitCharts. LitCharts LLC, 17 Sep 2013. Web. 21 Mar 2019. Sobel, Ben. "The Grapes of Wrath Themes: Dignity, Honor, and Wrath." LitCharts LLC, September 17, 2013. 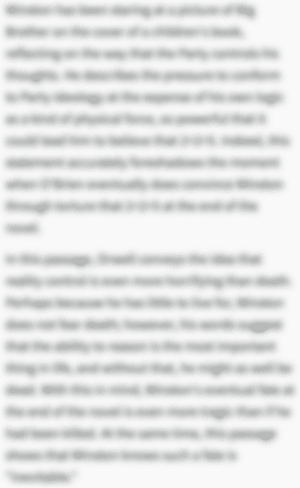 Retrieved March 21, 2019. https://www.litcharts.com/lit/the-grapes-of-wrath/themes/dignity-honor-and-wrath.